Sweet Floweret: Fabulous Find Friday! One thing that I inherited from my grandma was the desire to find a good deal. I think that's inherent in many women, but I know not all women feel this way. If I find something I've been looking for and it's a deal, it makes my week. It is in this spirit that I wanted to launch FABULOUS FIND FRIDAY. I am hoping that you can get into the spirit of this with me and that you'll send pics or link up on Fridays with your fabulous finds. It can be ANYTHING from ANYWHERE. Food, clothing, decor, accessories, kid stuff... Whatever! Share it with the rest of us. For a few weeks, I've been searching for some baskets for my mud room cubbies. Problem is, I had a specific vision of what I wanted; metal baskets that were wide enough for the cubbies and didn't cost an arm and a leg. I nearly gave up and bought some cheap and ugly baskets from Joanns. But alas, as fate would have it, I stopped into Hobby Lobby today and found three of these! 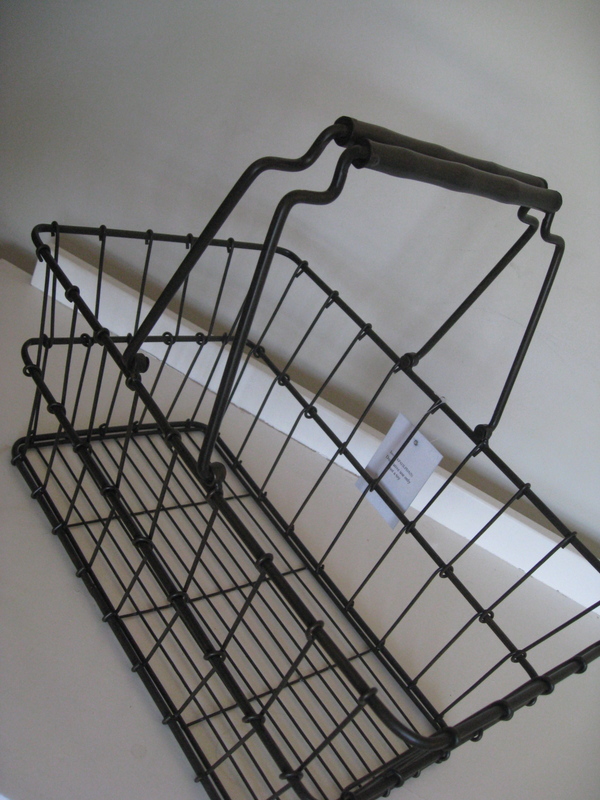 They are vintage style metal shopping baskets. Even better, they were 50% off. Ah. Satisfaction. You will see these again. I'm going to post my mud room reorganization project soon. Couldn't finish without these FABULOUS baskets! Please share your deals with me and others! We love to hear about them. Target and Old Navy have great kids clothes on sale/clearance. I got Kate a pink ruffled skirt ($5) and pink polka dot cardigan ($7) and Collin a had and mitten set $2) at Target. Old Navy has their $5 baby and kids sale going on now. love these! i found a red one at goodwill and am using it in my craft area for random sticker/die cut organization.